“Anyone worried about the future of publishing, whether in traditional or digital formats, would have their spirits boosted by attending (the ACT 3 Experience)” writes John Harrington, editor, The New Single Copy in this week’s newsletter. 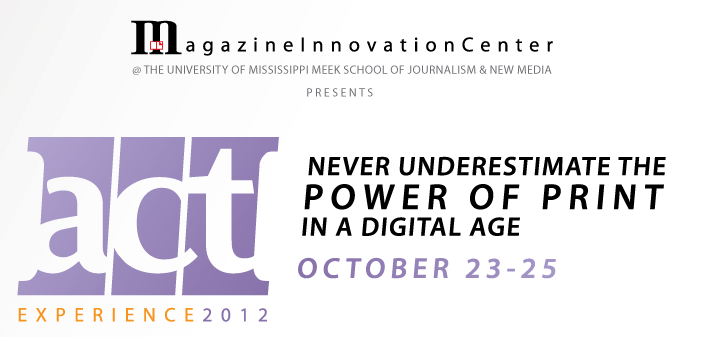 … However, the following week (Oct. 23 – 25), newsstand will definitely be on the agenda, at ACT3: “Never Underestimate the Power of Print in a Digital Age.” The third edition of “Amplify, Clarify, and Testify,” sponsored by the Magazine Innovation Center, at the University of Mississippi Meek School of Journalism and New Media, will be held in Oxford, Mississippi, October 23 to 25. The panel one that promises an a very diverse experience. Among the participants will be Keith Bellows, vice president and editor-in-chief, National Geographic Traveler; Rebecca Darwin, president and CEO, Garden & Gun; David Friend, editor, creative development, Vanity Fair; Sid Holt, executive director, American Society of Magazine Editors; Kevin Keefe, vice president-editorial, Kalmbach Publishing; Dan Lagani, president, North America, Reader’s Digest Association; Roy Rieman, founder, Reiman Publications; Michael Rooney, chief revenue officer, The Wall Street Journal; Bob Sacks, president, Bosacks.com; Tony Silber, general manager, Red 7 Media; and John Harrington, The New Single Copy. Thank you John. 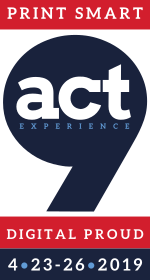 Space is limited at the ACT 3 Experience. To be one of the 60 people who can register to attend click here. Registration to the Experience is limited to 60 attendees and 20 students. You can click here to register for the event. Once 60 registrations are received the registration will be closed and no longer accepted. So be the first to register if you want to take part of this triple M experience Magazines, Mississippi and Music. 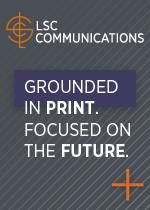 North America, Readers Digest Association, Inc.
COO, Democrat Printing & Lithographing Co.
For more information on the ACT 3 Experience click here and to be one of the 60 people to register click here. 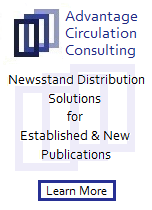 New ink on paper magazines are arriving at the market place at an exceptional rate: almost two a day. Some, of course, are much better done than others. Some will survive and stay in business for years to come, and some will die a sudden death before anyone ever hears about them. 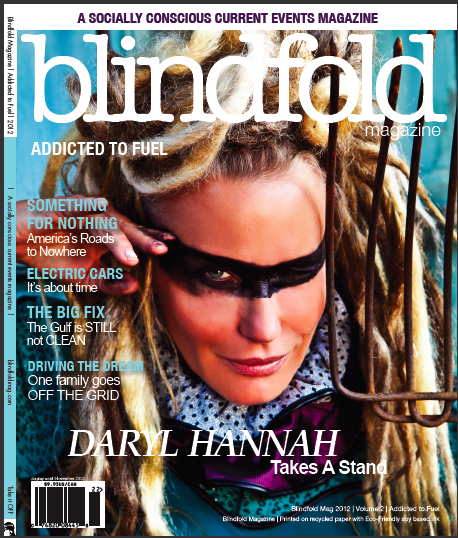 One recent launch, Blindfold, caught my attention and lead me to call the man behind the launch: Jeramy C. Pritchett, who is in his own words a “True Believer” and “Co-Founder” of the magazine. You are currently browsing the Mr. Magazine blog archives for July, 2012.